Unsure of these marks if anyone can identify and tell me more about this spoon it would much appreciated. The makers name looks to be I Chrick. SCHRICK for;Jean Adam Schrick II or his brother AndrßÆ? Schrick, (T) based upon town mark Colmar or other place Alsace region. 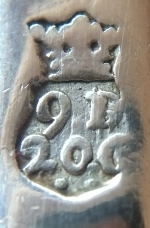 Many thanks Peter for the information, it’s a bit worn on the tip but a nice spoon to have as the crowned family crest is good and maybe I can identify the family it belonged to.